Divorce Forms are documents issued by a court of the law annulling a matrimonial alliance between two individuals. It contains extremely sensitive information about the applicants by which a divorce is granted. The whole process has legal implications, and various Sample Forms Free are available in this regard. Lots of sensitive information about the couples are viewed and exhibited, resulting in a traumatic experience for both. ‘Washing dirty linen in public’ is a famous proverb driving home this point. 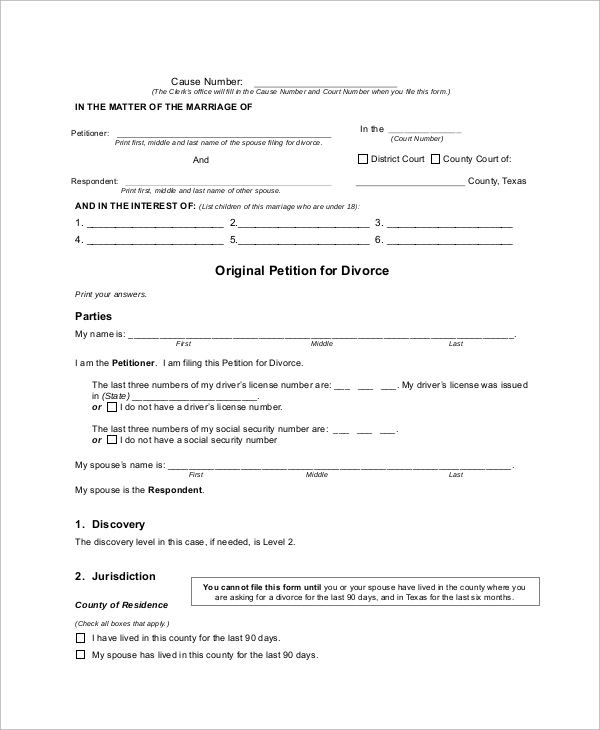 This form is issued when the divorce is granted and contains sensitive information about the petitioner and the respondent. It also indicates the date of submission and conclusion of the case. 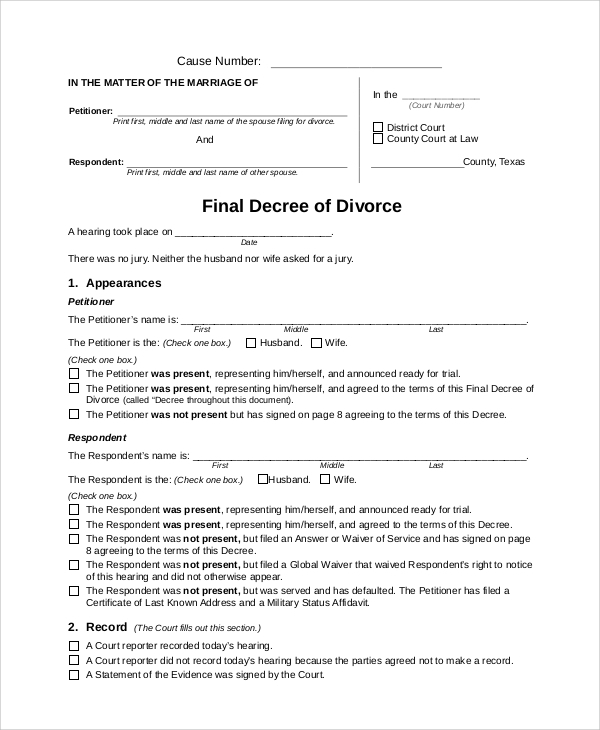 This form is used when a husband and wife first apply for a divorce. It contains all the necessary information right from the date of marriage to the date of separation, the reason for discord and the presence of children. This is a guideline explaining all the legal implications regarding a divorce. It also defines many legal terms, advice on how to approach, what forms to use and to prepare the petitioner and respondent for what to expect during the hearing of the case. 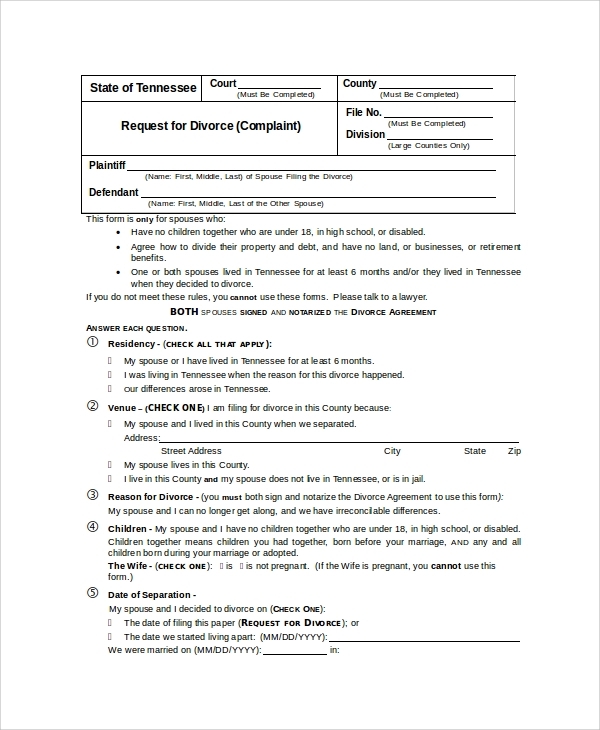 You may also see the Sample Affidavit Forms. 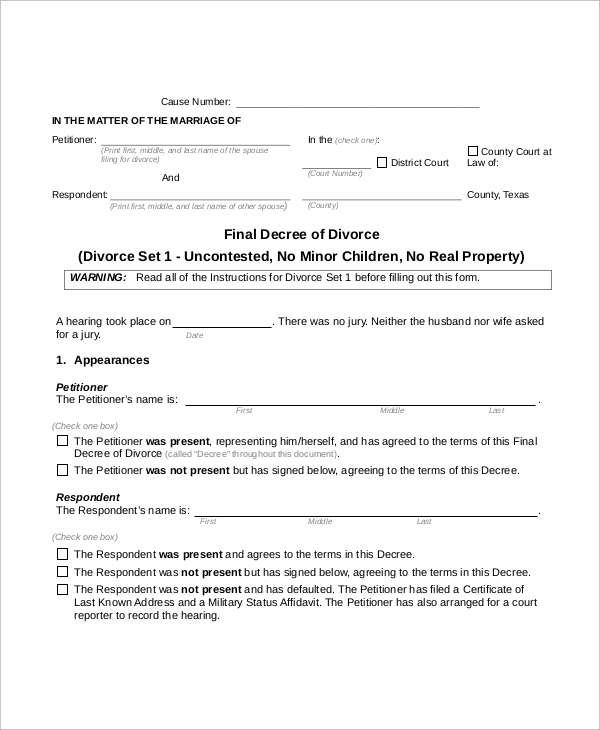 Divorce Forms used by estranged couples who decide to get their marriage annulled by a court of law. There are various types of forms available, and each varies according to the case. Some of the forms contain legal terms, and it is advisable that the couples seek the services of a lawyer who can assist them in filling all the necessary information. This process puts the whole case in perspective, as the concerned authorities get a clear idea about the nature of the dispute and reasons for separation. It also assists when property and assets have to be divided, and custody of minor children are awarded to either spouse. 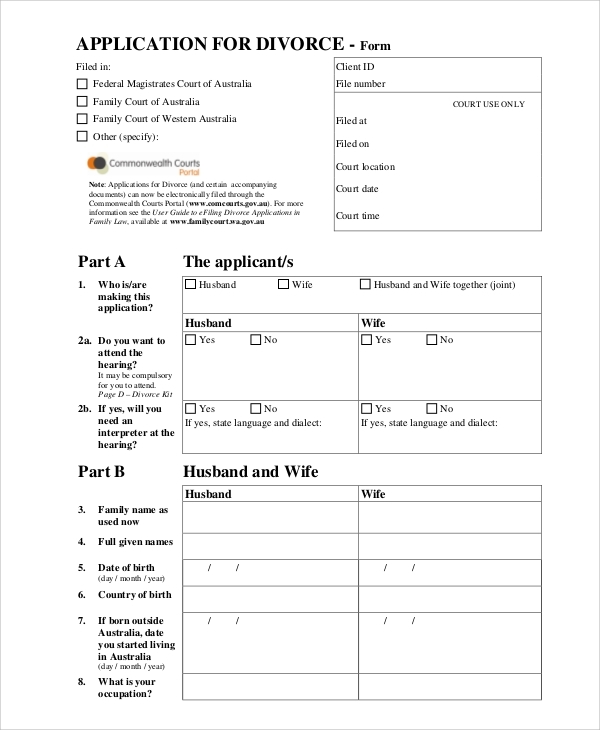 This form is for specific cases wherein the spouses don’t have children together, are under 18 years, in high school or disabled, etc. Those not falling into this category should not use this form. 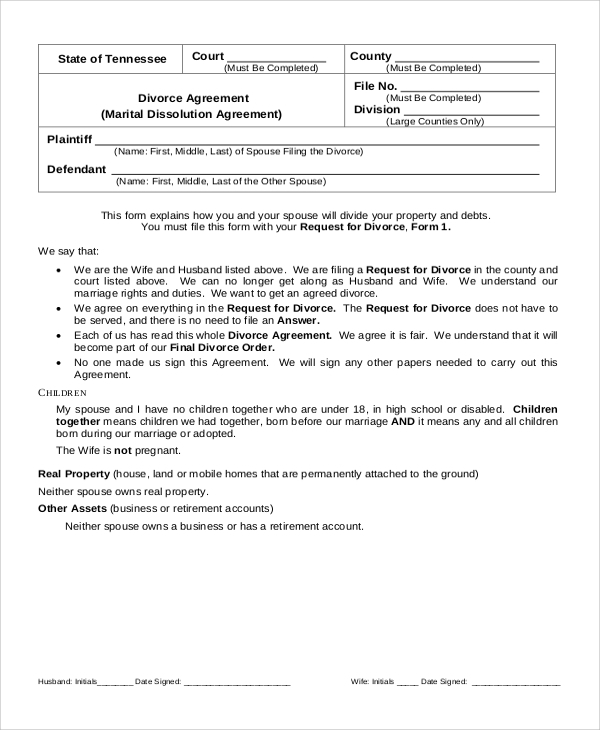 This form can be used when a couple seeks only a simple divorce without demand for a share in property or financial support post annulment. You may also see the Financial Declaration Forms. Why are these Forms Necessary? The forms play a vital role in defining the nature of discord, the time factor, and the presence of children, assets, property, etc. Without such forms, there could be total confusion and conflicting information will be passed on to create further conflicts. Couples fighting for divorce involving children and assets, some who seek only a simple divorce, childless and disabled couples, etc., can use these forms under the appropriate guidance of a lawyer. Divorce Forms play a crucial part in the whole process of marriage annulment. They have been drafted based on legal factors and implications. Because of the severity of the matter, sensitive and personal information have to be furnished via these forms to ascertain the reason for the divorce. The Sample Legal Forms can, however, cover other matters and are not restricted to divorce proceedings only.